mums – jen wewers, m.div. 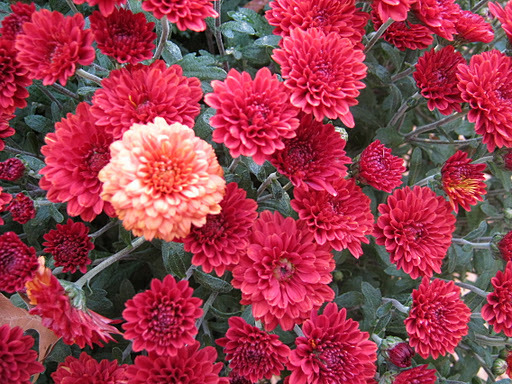 My brother David brought me the two most beautiful potted mums this fall – one bright yellow and the other deep red. Watering one day I noticed one small flower “that was not like the others” (please hum the Sesame Street tune). This sweet little bloom, more coral than red, stood out in the see of sameness. It got me to thinking. My mom always pumped us kids with how unique and special we were…we could be anything we wanted to be. I took that and ran with it….in all honesty I still am. Still not sure what I want to be when I grow up. My mom challenged all of us to think big….to dream…to imagine. One day I came home from a neighbor’s house. I was probably 7 or 8 years old. My friend had informed me she was going to grow up to be a secretary. She planned on sitting at her desk, painting her nails and putting on make-up. Still makes me smile that this was her vision of working. For some reason, I shared it with mom. Now, this was in the mid 1970’s – my mom had been doing assertiveness training and certainly reading a number of feminist books. On our car rides, we popped in the Helen Reddy eight-track and sang “I Am Woman Here Me Roar” as loud as we wanted. My mom saw all the possibility she imagined for me being eclipsed by a playmate who was dreaming different dreams. In that moment she asked me to think beyond who I imagined could be.